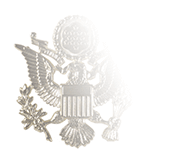 The Master Chief Petty Officer buckle is authorized as an optional wear item by Article 3603.6 of Navy uniform regulations. 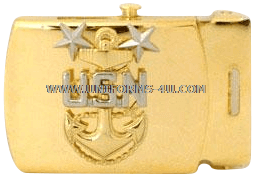 This gold belt buckle is available in Male and Female sizes and features the Master CPO insignia of a fouled anchor, “USN” initials, and two stars indicating the E-9 rate (two above the standard CPO rate of E-7). 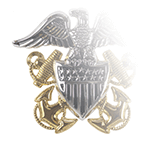 Until 1958, the highest rate an enlisted Sailor could hope to achieve was E-7, Chief Petty Officer. 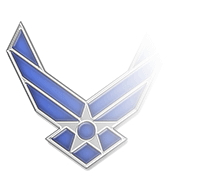 But that year Congress established two additional pay grades, E-8 and E-9, to encourage the retention of veteran senior enlisted personnel in all branches of the Armed Forces of the United States; these became Senior CPO and Master CPO, respectively. 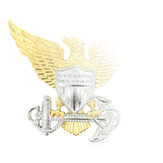 In the 1990s, the Navy expanded the roles of both these upper-level CPO positions by creating Command Senior Chief and Command Master Chiefs who were to serve as the command-level version of the Master Chief Petty Officer of the Navy, keeping commander apprised of the needs, concerns, and issues facing enlisted personnel. 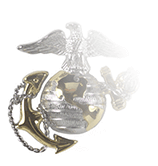 Command Master CPOs wear the same basic insignia as a Master CPO, but their rating badge features a star below the chevron rocker rather than a rating insignia (crossed cannons for Gunner’s Mate, for example), reflecting their role as Senior Enlisted Advisors.